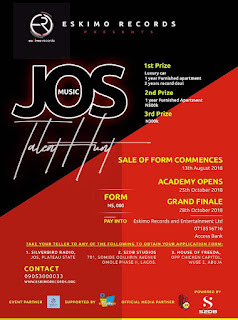 Jos Music Talent Hunt is a packaged event by *EsKimo Records* solely aimed at identifying, developing, encouraging and exposing the abundance of Raw Music Talents preponderant in Jos, Plateau State where the likes of Tu-Baba, Jeremiah Gyang, Mi berthed their enviable careers from. A recent survey revealed the enormous waste that will perpetually exist except a deliberate and well orchestrated focus is beamed. #50,000 as consolation prizes to the last 7 contestants. Take your Teller to any of the designated Centres and obtain a Form. 781, Somide Odujirin Avenue, Omole Phase11, Lagos. Opp Chicken Capitol, Wuse2 Abuja. 5 A' List Celebrities have been enlisted who will also perform at the Concert. *13th August* - Sale of Forms Commences. 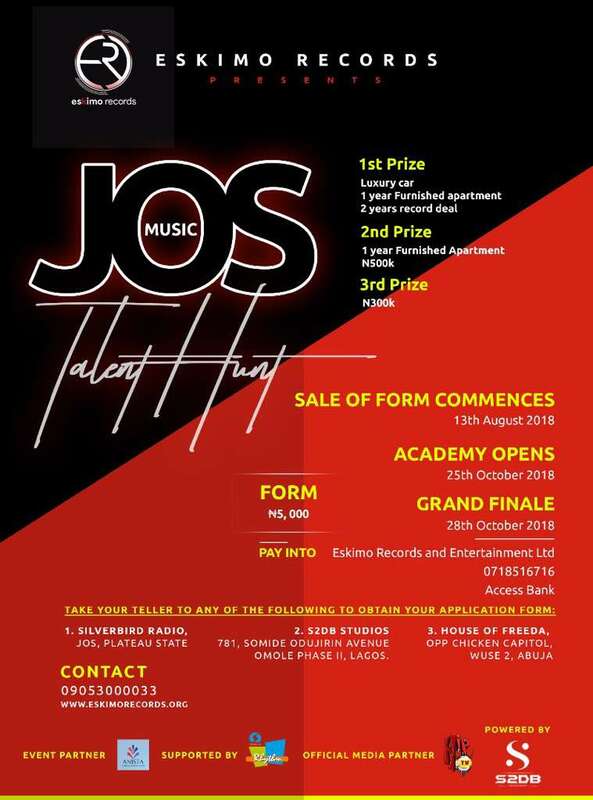 *20th October* Selected 100 Participants for the Music Academy. *25th October* Selection of Finalists by Judges. *28th October* Grand Finale Concert @Polo Field where Prizes will be announced Publicly.